Google’s Zineb Ait Bahajji was recently quoted as saying the upcoming mobile-friendly ranking algorithm that will launch on April 21st will have more of an impact on Google’s search results than the Google Panda or Google Penguin updates did. Get your website mobile friendly by April 21 or it’s search rankings and traffic will drop. Google also clarified in a Google+ hangout there are no degree’s of mobile-friendliness. A website is either mobile-friendly or its not. The easiest way to see if Google thinks your web page is mobile-friendly or not is to pick up your phone and search Google for your site. If you see the mobile-friendly label next to your site in the live mobile search results, it’s mobile-friendly. If not, it’s not. You can also use the mobile-friendly testing tool, which should match the live Google search results. We can create a mobile-friendly website for your organization pretty quickly but you’ve got act fast. This is not some manufactured urgency. The April 21 launch date is coming up fast and a lot of website developers are getting inundated with request to make websites mobile-friendly. If we might be able to help you make your website mobile-friendly, please contact us. 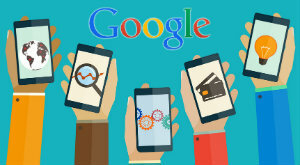 What do you think of Google’s coming mobile-friendly algorithm change? Is your website mobile-friendly? Are you taking steps to make it so?